It’s early October 2018. Very early in the morning, much earlier than usual for me for my regular judo practice. I’m in a cab, actually more like a tiny circus car for no more than two people, going with Sensei Manoj to the outskirts of Kathmandu to visit an orphanage where he has introduced judo. It’s not far from my hotel, but given the traffic and road conditions it takes us more than 35 minutes to go only a couple of miles. Far from the hustle and bustle of downtown Kathmandu, nestled in the hills of a neighboring town called Nakhu, is the HOPAD Judo Club. Its members (boys and girls aged 8- 17 years old) are all orphans living at the HOPAD Child and Women’s Promotion Society (donations welcome! ), just down the dirt road from the dojo. The kids all live and study together at the orphanage and a brief visit to their rooms confirmed that they are just like any other kids with posters of Messi, Ronaldo and Teddy Reiner. I didn’t expect to see Reiner, which shows the influence that judo is already having on their lives. I’m in Kathmandu for a few weeks for work in local philanthropy. I brought my judogi because I had already managed to connect on Facebook with a few Judo practitioners in Nepal judo in hopes of finding a club to practice at while in Kathmandu. Thus I had met Sensei Manoj, and was promptly welcomed as a friend and brother. I have since made many new friends in Nepal, and helped train two of the country’s 2020 Olympic hopefuls. Countries build walls and judo tears them down. I can’t wait to return after this truly inspirational and humbling experience. We drove right past the dojo on our way to HOPAD. It was easy to miss. The dojo is a carefully balanced structure of corrugated metal sheets and bamboo, like playing cards balanced together. It has neither a door nor electricity, but only a bare inner room furnished with tatami mats, a far cry from the large gym we use for judo at home. But it hosts a group of highly spirited players eager to learn and play judo. I am the first American judoka -just a simple guy in Kathmandu for work – to visit this club, and I hope not the last. But I was treated as family by complete strangers and the kids from HOPAD want to be Facebook friends with me now. I gratefully accept. Many years ago I started the Sport for Social Change Network, a platform of non-profits that use sport and play as a vehicle to develop the lives of youth; around the same time I also joined the Board of Rational Games as the officer in charge of grantee relationships. All this because I deeply believe that sport and play have transformative power not only on youth and are especially influential in the fields of public health, education and empowerment and conflict resolution. Today, as a Rational Games Board Member, grant giving for projects engaged in sport and play to resolve conflict is at the heart of our mission. 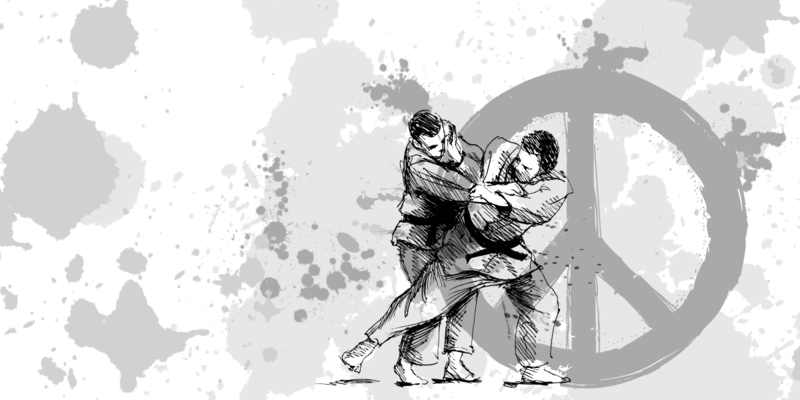 At Rational Games, we also teach negotiation, and judo is indeed physical negotiation. As players, we don’t so much announce what we’re going to do, but rather communicate that intuitively, emotionally, without words. But with every push or pull from my opponent I must decide on an appropriate reaction. Should I give way and enable the push by accepting my opponent’s force to perhaps ultimately use it against her later or rather stand strong, unyielding and balanced, with convincing resistance? In this push, pull, spin, and constant jockeying for the best position there is always supreme respect for the opponent…. Just like in genuine win-win negotiation. After judo practice, Manoj and the HOPAD Director and I talked over tea about strategies to raise funds for the judo club and for HOPAD. Having worked in non-profit granting for more than 20 years, and aware of the deep connection between judo and negotiation, as well as between hospitality and philanthropy), I left them with many resources and ideas to help HOPAD sustain and succeed financially. Comments welcome, especially from fellow philanthropists and judo practitioners!